End the black hole where resumes die and disappear. These job search sites will keep you abreast of your job application progress. The hunt is on for a killer job-search app. Technology was supposed to revolutionize the courtship dance between employers and prospective hires, matching the right candidate with the right job in just a few clicks. Instead, Web-based job-hunting tools have left human-resources department with too many résumés and have given job seekers the sense that applying online is a waste of their time. 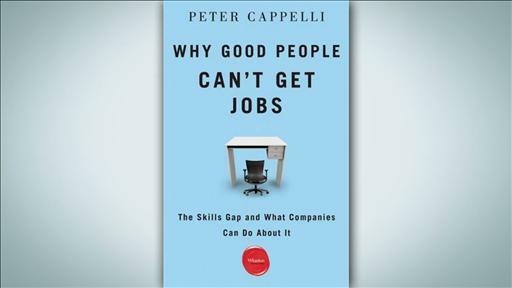 Wharton’s Peter Cappelli explains why the hiring process is frustrating for employers and job seekers and how to fix the problem. Now, a host of technology firms large and small are racing to build tools to improve the experience for both sides. The holy grail: software that can read résumés intelligently, flagging a handful of truly promising candidates to recruiters and alerting job seekers to openings that are laser-targeted to their skills and background. And no wonder: Companies are expected to spend $5.75 billion on online recruitment in 2012, and their outlays could climb to as high as $10.4 billion by 2016 if the weak job market recovers to normal levels, according to market-research firm Borrell Associates Inc.
“You can see from that amount of money why people are pursuing this magical algorithm,” says Kip Cassino, executive vice president at Borrell. Among those trying to crack the problem is tech entrepreneur Chris Forman, who was inspired to develop job-search tool Startwire.com when he was managing a recruitment-outsourcing firm and listened in on calls between his employees and job applicants seeking updates. “Nothing was more emotional and painful to listen to,” he says, adding that the experience helped him understand how it felt to apply for a job and get no reply. “I knew if we solved that problem, there would be a business wrapped around it,” he says. Launched in 2010, Startwire communicates with corporate applicant-tracking systems to follow users’ job applications, automatically sending them updates on the status of those applications. Startwire also analyzes its 275,000 users’ past applications and activity to suggest relevant job postings. Another contender is Jobfox.com, founded in 2005 by CareerBuilder creator Rob McGovern and revamped in 2011 to integrate with LinkedIn and Facebook. The site uses detailed profiles and professional groups—individuals can join the networks of recruiters at companies where they would like to work—to connect employers and prospective candidates. Pioneering online job boards like Monster Worldwide Inc.’s MWW +0.45%Monster.com and CareerBuilder are also rushing to reposition themselves with social-media apps and search algorithms designed to sort résumés in a more nuanced way than the original keyword-based model. CareerBuilder is jointly owned by newspaper publishers Gannett Co., GCI -1.21% Tribune Co. and McClatchy Co.
Venture-capital investors, too, are pouring money into such efforts. 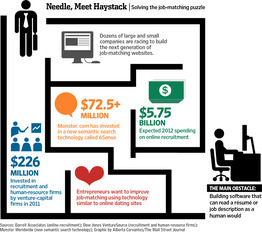 In 2011, U.S. human-resources and recruitment companies—a group that includes firms building job-matching tools—raised $226 million in venture funding, more than triple the $83 million invested a year earlier, according to Dow Jones VentureSource. “Now is the time to partner with these companies, so you can help build them to take advantage of the labor market when it turns around,” says Benedict Rocchio of Baird Venture Partners, which has invested in Startwire, Snagajob, and other online-recruitment firms. For developers, the challenge is teaching computers to think like people, improving the artificial-intelligence aspect of software so that it replicates the human elements of job search and recruitment, says Matt Sigelman, CEO of Burning Glass International Inc., a job-matching technology company. “When you think of how a recruiter would read the document, they don’t sit there with a highlighter pen and say, ‘She used this word 19 times, she must be better than the person who used it nine times.’ They see an arc of a career path,” says Mr. Sigelman. Tech firms are taking two main approaches to solving the problem. The first, semantic search, allows for a more sophisticated interpretation of text. While a keyword job search for “certified public accountant” might turn up ads seeking a small-business chief financial officer who is also a CPA, semantic-search software would intuit that the user is looking for accounting jobs and list only those openings. Monster.com is staking its future on a version of semantic search called 6Sense, used in its SeeMore and Power Resume Search products. The second approach works like online dating services, requiring job seekers and sometimes recruiters to fill out detailed profiles or questionnaires about their goals so that the software can suggest potential matches. But while active job seekers might be willing to spend 20 minutes filling out such a profile on a service like Jobfox, harried recruiters or “rock star” prospects—those not actively seeking a job, but who are most coveted by recruiters—may not take the time, experts say. The trick, says human-resources-technology consultant Elaine Orler of Talent Function Group, is building software that can predict a good fit between candidate and employer. “Cultural and behavioral fit is a stronger indicator of success and business performance [than keywords],” she says. As recruiters rely ever more on their employees’ social and professional networks for job candidates, the job-matching tool of the future must seamlessly integrate with LinkedIn or Facebook; it will have a heavy mobile component as well, experts say. As developers attempt solutions, those on the front lines of job search and hiring won’t wait forever. Recruiters, the paying customers for job-board databases, are growing impatient, spending a greater share of time and money on social-networking sites, enhancing their own career sites or pursuing other ways to marry technology with the personal touch that drove hiring before the Internet age.